There is doing good for the world, and then there is giving all you can in the pursuit of a better planet. Seizing each opportunity like a young woman who goes out day after day to pick up the garbage that others carelessly fling to the ground. She won’t pick up all the trash, but she’ll try, and every little bit helps. Perseverance is her courage that braves to pursue the impossible. She’s determined that a better world is possible. Volunteer grants are opportunities to increase fundraising through corporate giving that can lead to greater success for your nonprofit. Money always helps, because everything costs money, and failing to collect as much money as possible can result in being able to do what you need to do, but not being able to do everything that your nonprofit could do. You have a mission to accomplish, and, while ultimate success may be some seemingly unobtainable dream, you must do everything you can to make success a reality. Individual volunteer grant – Individuals volunteer for a nonprofit and earn money from their employer according to the time duration of their service. Team volunteer grant – Groups of employees volunteer together and earn money according to the amount of time they serve. Group sizes necessary to receive team grants vary by employer. Which companies offer dollars for doers programs? Many companies, large and small, offer volunteer grants in varying capacities. The following is a list of companies with exceptional volunteer grant programs – "dollars for doers" – that encourage employees to get more involved in exchange for substantial gifts to their employees’ beloved causes. No man is a volunteer island, at least as far as Best Buy is concerned. Best Buy only offers team volunteer grants. A perk of requiring employees to volunteer in teams is that group activities help to build camaraderie among employees. Happier employees typically equates to better company loyalty, so employees will be more satisfied with their jobs and more enthusiastic about their work. 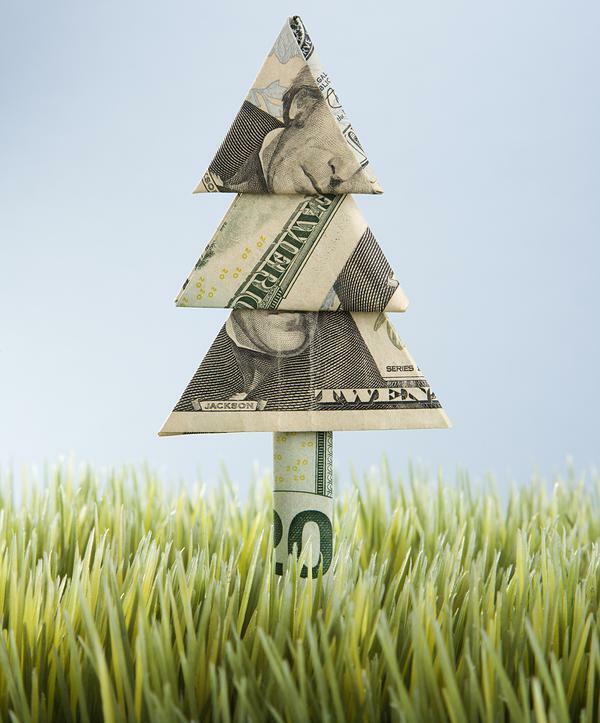 A single nonprofit can receive a maximum of $10,000 per year in Best Buy donations. The program’s design allows various locations to spread out their grants in order to help many organizations throughout the year, as opposed to one nonprofit all at once. One of the perks of having Best Buy employees volunteering with your organization is they’re normally tech-savvy. Leveraging a volunteer’s skill set is one of the best ways to turn short-term volunteers into long-term volunteers. Looking for a nonstop flight to fundraising success? Unfortunately, Boeing’s planes only fly to geographical locations, but the money their employees can raise for your nonprofit through volunteer grants could take you to the financially successful place that you want to be. Employees can raise money for multiple nonprofits, but at least 25 hours of service must be provided to each organization. Boeing gives until January 31st of the year following the volunteering for grant requests to be submitted. Energy is just what your nonprofit needs. Good, clean, green energy. ConocoPhillips won’t give your nonprofit free gas, but it will give you free money if its employees dedicate enough time to your organization. ConocoPhillips individual volunteer grants – Volunteers must provide a minimum of 20 service hours to a nonprofit. 20 hours of time results in a $500 grant, while 40 volunteer hours equates to a $1,000 grant, which is the maximum that may be attained by a single volunteer. ConocoPhillips team volunteer grants – Four or more ConocoPhillips employees must volunteer for a total of 40 hours to earn a $1,000 grant, which is the only amount that teams of volunteers can attain. For nonprofits that have trouble identifying who volunteers work for, prospect research can help to find employer information, as well as other donor data that can aid fundraising efforts. The gas is always greener. Well, depending on how many ExxonMobil employees volunteer for your nonprofit. ExxonMobil offers both individual and team volunteer grants. A dedication to providing volunteer options helps to build company loyalty, as employees have the flexibility to help nonprofits in groups or to pursue individual passions on their own. Either way, ExxonMobil is proud to sponsor the causes that their employees care about. ExxonMobil makes it easy for employees to submit grant requests through an online portal. Many companies have gone electronic in an effort to save paper and make submitting requests a streamlined, painless process. That said, many companies still accept paper requests through their human resources departments. Intel’s little chips help technology to work, and their big grant gifts can help your nonprofit to function at full capacity. Intel’s volunteer grant program rewards individual employees for their dedicated service efforts. $10 are given per hour after the minimum of 20 volunteer hours has been attained. Like many companies, Intel institutes a minimum for how many hours an employee must volunteer before being able to receive a grant. Volunteer hour minimums both ensure employee loyalty to a nonprofit and help to check that nonprofits are credible organizations worth volunteering for multiple times and worth giving money to. How can nonprofits promote volunteer grants? Nonprofit marketing is all about standing out from the bevy of other organizations fighting for attention. Promoting volunteer grants can take one of two approaches. Your nonprofit can promote volunteer grants as a giving option or you can encourage people to volunteer and use volunteer grants as an incentive to do so. The approaches certainly overlap, but they differ in how organizations prioritize volunteer grants in their marketing. 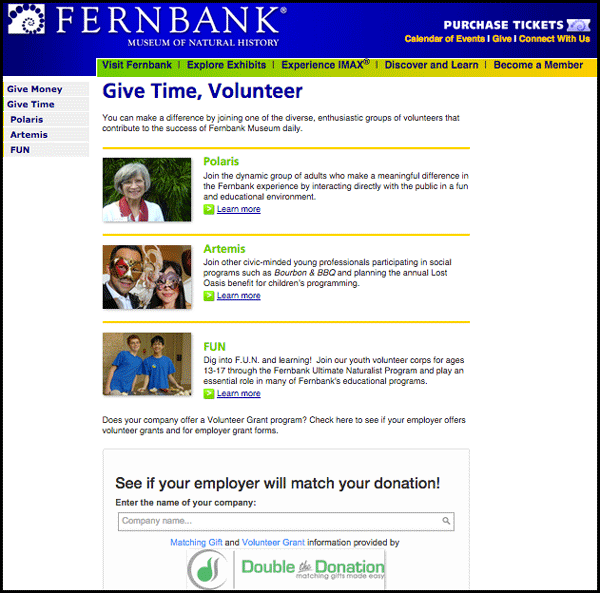 Fernbank takes the approach of encouraging volunteerism through three volunteer offerings. They have an option for adults, young adults, and kids. It’s at the bottom of the page that they remind volunteers that their time can be matched by monetary donations from employers. The Double the Donation box is a search widget that makes it easy for volunteers to look up volunteer grant information. Other organizations are more forthcoming with volunteer grant promotion. While they obviously appreciate and support volunteerism, they more directly promote volunteer grants, as opposed to primarily promoting volunteerism. The page explains both matching gifts and volunteer grants and details how they can benefit the organization. They also team with Double the Donation to make looking up matching information as easy as possible. A matching gift/volunteer grant search service is not a necessity, but it does make it easier for donors and volunteers to access the information they need to make donations. The easier information is to obtain, the more likely people will be to take the time to submit volunteer grant requests. Big Brothers Big Sisters lays out how to submit a volunteer grant in three easy steps. This is the kind of intuitive page that nonprofits want to emulate. If you spell out how to submit grant requests then it’s easier for people to see how easy the process is and to take the necessary action to raise more funds for your nonprofit. For organizations looking to do some marketing off of their own site, social media provides a growing outlet for nonprofits to connect with volunteers. 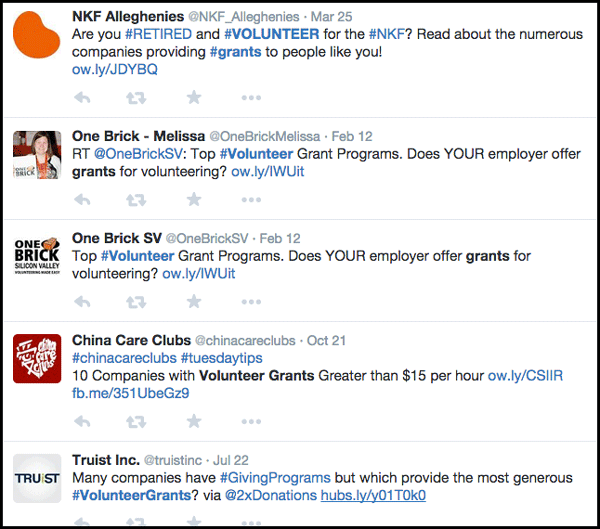 All of these organizations share valuable volunteer grant information with their followers. Many organizations want to educate their donors and volunteers about the bevy of giving options available. When more people know what dollars for doers programs are and how they benefit nonprofits, the chances are that more people will take the time to submit grant requests after volunteering. There are a host of additional ways to promote volunteer grants. 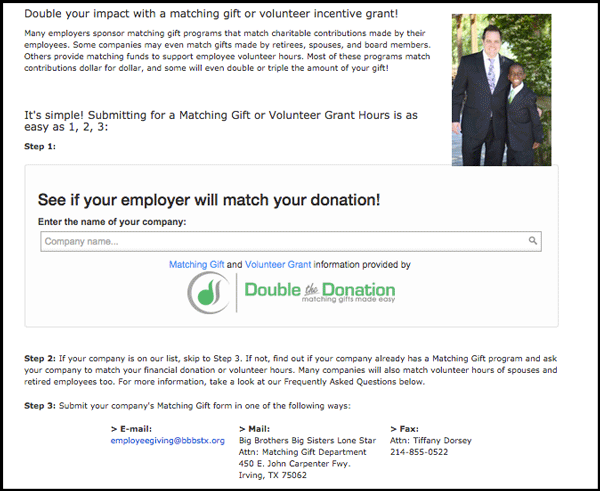 Double the Donation provides a detailed list of ways to market matching gifts, and from emails to incorporating information across your website to promoting in direct mail pieces, nonprofits can tweak these strategies and make them tell powerful stories through online content that’s specific to dollars for doers programs. You’re a nonprofit on a mission to make the world a better place. Every dollar counts, and volunteer grants can be an easy way to raise money from people who already support your organization. Volunteerism pays huge dividends for local communities. It can also pay your nonprofit.